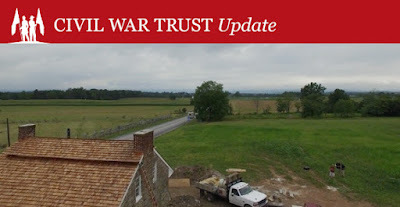 You may recall in 2015 with your help we saved a key piece of unprotected ground at Gettysburg: Lee’s Headquarters. Thanks to members like you we ensured the property would remain protected for future generations. I think it’s safe to say this is, by far, the most important thing we’ve done at Gettysburg. But our work didn’t end with just buying the land it rarely does. In addition to saving Lee’s Headquarters, we began the detailed task of restoring the house and the surrounding property to its 1863 appearance. This included the removal of numerous non-historic structures, restoring the wartime contour of the land and, most importantly, removing the modern additions to the historic house itself. If you drive past Lee’s Headquarters today, you’ll see it looks nothing like it did six months ago. There is still work to be done, but I can say this with complete sincerity: thanks to you, this land now looks more like it did in 1863, than it has in the last 80 years. Watch this video to learn more about how this project is going including some superb time-lapse footage of the restoration in progress.